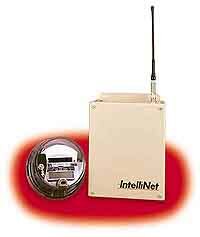 The IntelliNet system offers real-time meter reading on the Internet. Each meter site self-configures into a wide area radio network, and is also a repeater site for other meters. A network host is each region manages two-way wireless packet data. At the host, meter data is continually sent over the Internet, alarm and facilities data is immediately dispatched, and energy management data and commands are exchanged between the user, automation software, and the facility. AES Corporation, 285 Newbury Street, P.O. Box 2093, Peabody, MA 01960. Tel: 978-535-7310; Fax: 978-535-7313.